Earlier today, while doing our daily data mining, we came across a new variant of ZeuS 2.x. It includes a new backdoor command called: win_unlock. 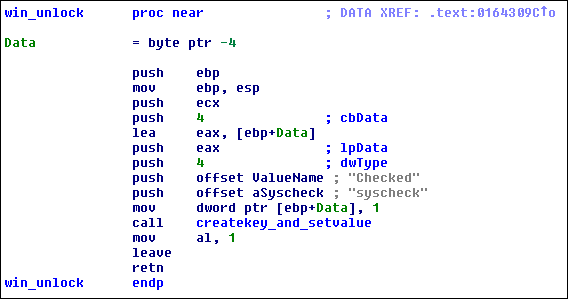 Very interesting, turns out this slightly modified ZeuS 2.x includes a ransomware feature. When this particular variant is executed, it opens Internet Explorer with a specific page (lex.creativesandboxs.com/locker/lock.php) and prevents the user from doing anything else with the infected system. The webpage that was opened presumably showed some type of extortion message, but it's currently unavailable because the site is offline. The most straightforward way to unlock the system is to simply delete the trojan. This can be a bit tricky since the trojan prevents doing anything with the infected system, luckily the locking itself can be easily disabled first. Looking at the code that corresponds with a received win_unlock command, it's clear the unlock information is stored to the registry.